If you’ve never attended a rendezvous before, it can be a little intimidating. Quantum’s Clark Simensen shares his experiences and tips on a fun and fulfilling event. 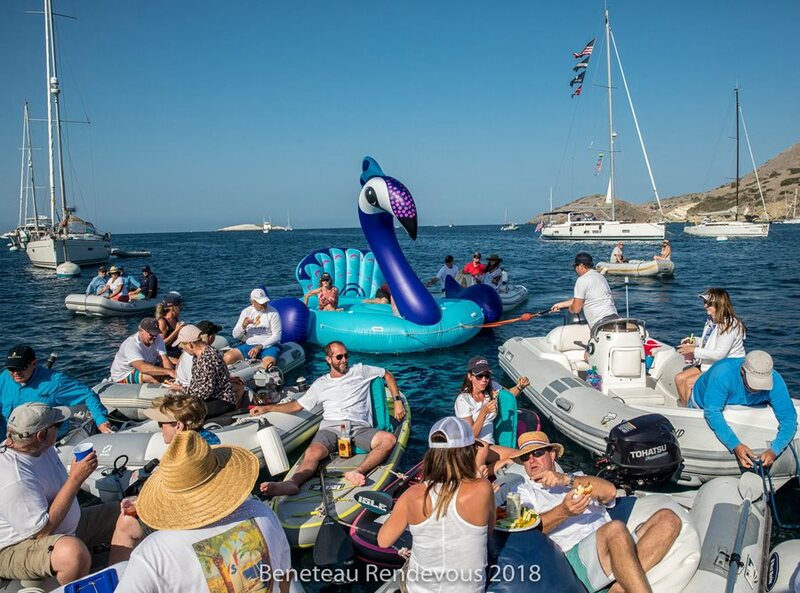 Photo by Beneteau Rendezvous 2018 & Cynthia Sinclair. I’m a big fan of cruising rendezvous. As a life-long sailor, one of the favorite elements of my beloved pastime is the community it creates. Rendezvous are a great way to meet like-minded sailors from all over the world and to build a robust network of friends. 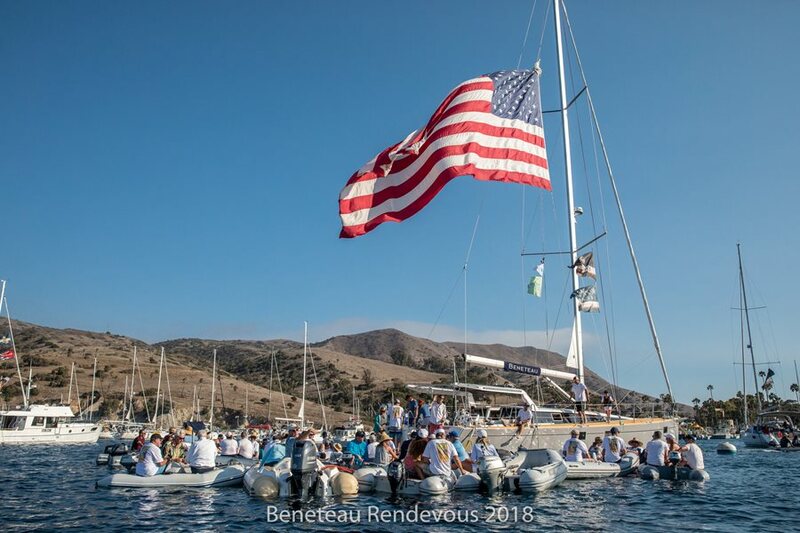 Here are some tips and examples from my experience at the 2018 Beneteau Rendevous at Isthmus Cove in Catalina Island, California aboard my Oceanis 41.1 Lucca. If my recollections of the event don’t make you want to sign up for the nearest rendezvous, I’m not sure what will. South Coast Yachts, Naos Yachts, and Beneteau America cordially invite you to attend the 2018 Beneteau Rendezvous! 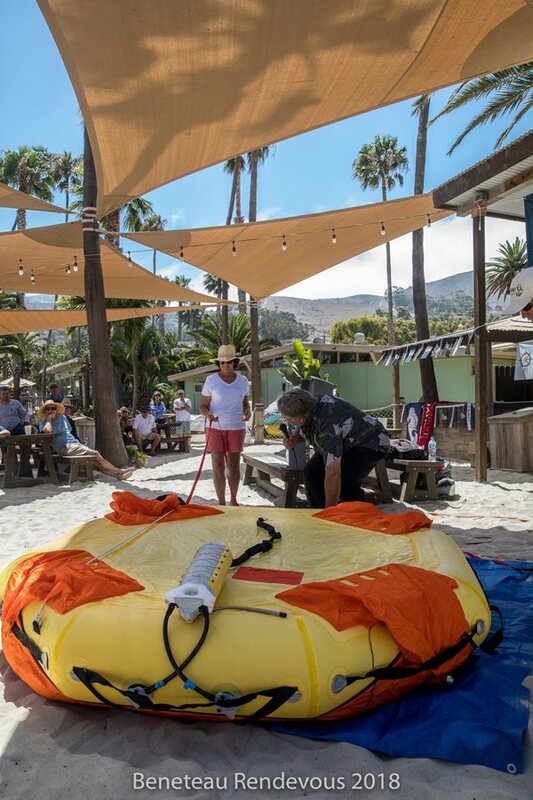 This year’s event is scheduled for August 3rd-5th at Isthmus Cove, Catalina Island. Many sailors head over on Thursday the 3rd to claim their moorings and to extend their time on the island. Moorings are first come/first serve, but if you are registered, they are expecting you. Please join dozens of other Beneteau owners and friends for this fun and festive weekend. Don’t wait… RSVP today and fill out your attendance form. All boat brands and new friends are welcome! “The more, the merrier!” See you there! This invite was enough to get me excited. Once you’re signed up for a rendezvous, I recommend a little pre-work to learn about the area and to read any information provided prior to taking off. It will help you come up with a rough plan and make sure you don’t miss out on anything or forget to pack something that would come in handy like snorkel gear. Whether you’re a seasoned sailor or new to sailing, you can join the flotilla to enjoy the social atmosphere with your fellow sailors. Use the flotilla as an opportunity to meet people and get excited about the rendezvous. Let the fun begin - Clark Simensen skippers "Lucca" on their way to start the fun. 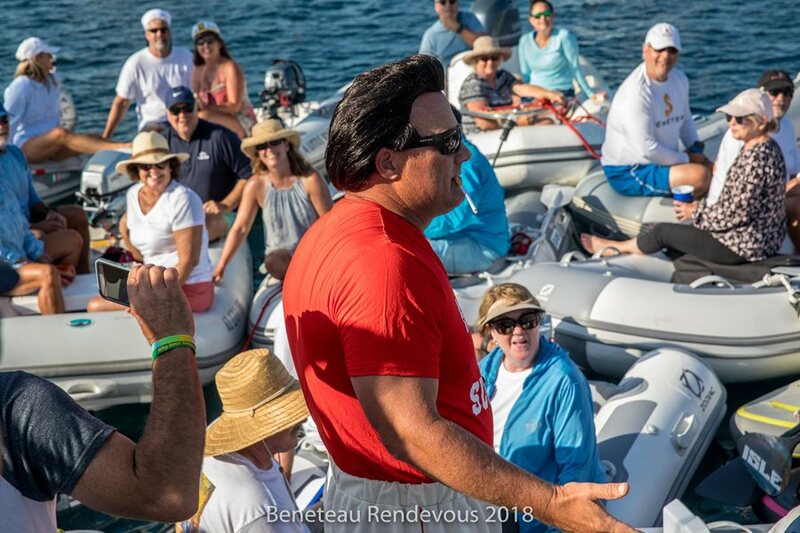 Photo by Beneteau Rendezvous 2018 & Cynthia Sinclair. Everyone was invited to participate in a Flotilla from San Diego that departed at 6am. We picked up the pace to about 8-9 knots and cruised through calm conditions and lots of marine life. Pod after pod of small bottlenose dolphins followed us throughout the day, diving and jumping around us as we trucked along. We arrived at Two Harbors at 6pm, grabbed our mooring, and settled into island pace. Ready to meet new people, we put on our Beneteau swag and headed to the Harbor Reef Bar. There were no scheduled activities, just a short discussion and an overview of the activities for the next four days. Excited for the rendezvous to officially begin, we dove into the fun and let the vacation begin! Simply participating in the planned events at rendezvous can open up a lot of new and valuable experiences. Whether you’re using another’s expertise to try a new activity or attending a luau under the stars, just showing up with a positive attitude can lead to fun and memorable adventures with new friends that will greatly enrich your rendezvous experience. Keeping with the theme - Rendezvous often have a theme. This event's was the movie Grease. Come prepared to participate! Photo by Beneteau Rendezvous 2018 & Cynthia Sinclair. The first half of Friday was free to enjoy Isthmus Cove, go snorkeling, hiking, napping on the boat, and soaking up as much relaxation as we could. Rick Day from Seahorse offered to lead a snorkeling trip around Isthmus Cove and Ship Rock to see leopard sharks. We took advantage of his invitation and departed at 2pm for an exciting underwater experience. We saw lots of harmless small sharks, bat rays, garibaldi fish, and other bright marine creatures. We were glad we had our own snorkeling gear so that we could participate in this impromptu adventure. Registration at the Beneteau Compound began at 4:30pm. We received our gift bag, goodies, T-shirts, and 2018 Beneteau burgee (look for the “B” flags flying!). The bar was scheduled to open at 5:3pm, so we were banging on the door by 5pm! The Welcome Party Happy Hour started at 6pm and was followed by the Island Luau Buffet on the beach at 7pm. There was a wide array of spring rolls, pork dishes, exotic leafy greens, and other crazy delicious foods I couldn’t even identify. We danced, limboed, laughed into the night, and had fun meeting new sailing friends and sharing adventurous sailing tales. With so many resources gathered together in one place, these rendezvous can be amazing opportunities to expand your knowledge, especially when it comes to safety. Take advantage of the experts and seminars. Refresh your skills and soak up as much new information as you can. Safety first - Rendezvous are a great place to pick up new skills and learn about gear that might save your life. 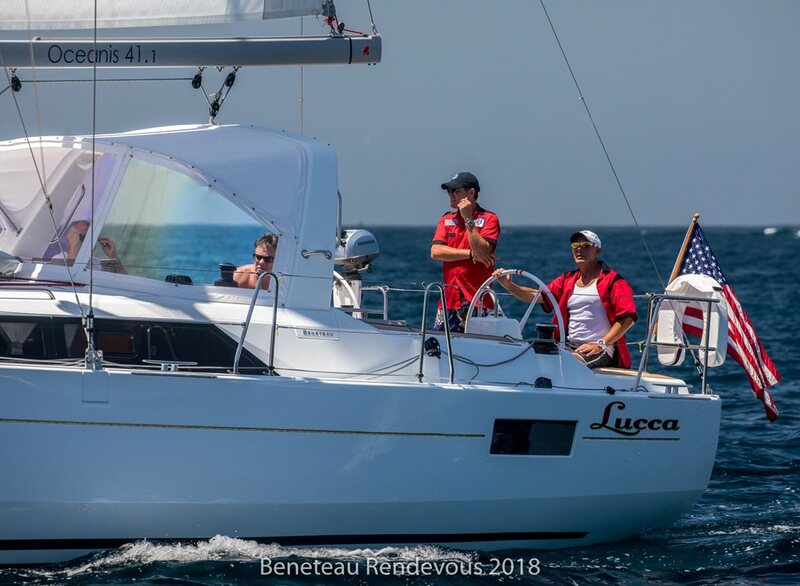 Photo by Beneteau Rendezvous 2018 & Cynthia. We enjoyed the big Two Harbors Hot Breakfast at 9am and then attended Seminars in the Sand from 10am to noon. The seminar included a recap of Pac-Cup on the Figaro 3 foiling monohull with Charles Devanneaux, Beneteau updates with South Coast, important service and maintenance topics, and safety topics with Bruce Brown. Bruce also introduced a bunch of cool, innovative safety inflatables. The lunch break from 12:00-1:30pm was BYO or at the Harbor Reef Café, followed by the Thunder Road Regatta. This themed regatta, based on the movie Grease, was a fun course with some wacky twists and turns. The brokerage sailed their new 2019 Beneteau. Our boat, Lucca, took sixth out of 12 boats! Considering that most of the other boats were 50-plus footers and had waterline on us, we were excited about how we handled our 41.1’ shorty. This regatta turned out to be during one of the most picturesque afternoons in southern California, or at least Catalina Island, and we have so many beautiful photos of our boat under sail. After our all-in fun regatta, we attended the Sail Trim Seminar from 3:30pm-4:30pm and had the opportunity to check out the new Beneteau Sense 57 and Beneteau swift Trawler 44. After the seminar, we gathered up our best cocktails and appetizers and got in our dinghies for the Dinghy Raft Up from 4:30pm-6:00pm. We gathered around host boats Seahorse, Sense 57, and Tide Chaser from South Coast and shared recipes and dishes. After the raft up, we dressed up as our favorite characters from Grease and headed to the Grease-themed party (6:30pm-9:00pm-ish). There were two open BBQs, light appetizers, and a cash bar. There was music on the beach, a raffle, prizes for best outfits, and a lot of dancing. Make the most of your vacation and take some time before you go home to fully recharge by doing something you love to do by yourself or with your family. Go exploring, try something new, or squeeze in one of your favorite hobbies like biking or stand-up paddle boarding. Most boats left on Sunday, but we stayed another day to enjoy the island without an itinerary to follow. We hiked across the island, swam a bit, snacked a lot, and just took it easy. It’s easy to get caught up in our busy routine of our lives and just go through the motions, even when we’re sailing. If you make the most out of a rendezvous, it can inspire you to connect with the real reasons you’re a sailor. Whether you’re in it for the challenge, for family time without distractions, or to experience nature and wildlife in peace, take some time either during the rendezvous or on your way home to reconnect with this reason and get you excited for your next adventure on the water. We had a relaxing 11-hour motor back to San Diego with whales, dolphin pods, and time to reflect on the gathering. We chose not to sail back due to our time, but we still enjoyed our peaceful time on the water. We arrived at 7pm and, even though we’re tired, we’re already excited about next year’s rendezvous! Feel free to reach out to your local loft or rep if you want help finding a rendezvous near you. Or you can always connect with your friends and start your own.